Hello, world. Here's another random, non-comprehensive status update regarding our servers, quite possibly the last one before the end of the year. So what are we dealing with lately. Well, carolyn (the mysql server) seems to have some funky memory. Or maybe it's an overactive watchdog in the kernel. Hard to tell, but the warning messages we're getting aren't given us the warm fuzzies. Operations are more or less normal, so we're just keeping an eye on it for the moment (don't really want to do any surgery before the holidays). Meanwhile, it did have a standard issues CPU lock last week, requiring a hard reset and database recovery. However annoying (and it seems the modern day linux kernels are getting more and more prone to this sort of misbehavior) it's so far easy enough to recover from after hard power cycling the machine. We have to do this a lot on bruno (the upload/compute server) quite often, and oscar (the informix database server) the other day as well. Every time we eventually recover just fine. Also mysql-wise, we seem to be having performance issues that defy easy understanding and explanation. Maybe this is memory related (hope not), but probably just due to some black-box mysql internal bookkeeping. During some testing/tweaking I turned off the daily stats dump scripts, and (oops) forgot to turn them back on. So there was a period of 5-6 days without stats dumps. Sorry about that. Another thing we have to keep an eye on is server closet temperature. Seems like (without clear notification) we are already in "holiday energy curtailment" mode. With less people around, lab-wide environmental controls (which assist our server closet cooling) are ramped down to save energy. Makes sense, but that still means temperatures rise in our closet, which isn't happy-making. So far they only went up a degree or two on average. Just one more thing to worry about. donation page for a link to their paypal-based donation site) going towards this new hardware. Message 1179614 - Posted: 20 Dec 2011, 23:42:09 UTC - in response to Message 1179613. Thank you very much for the update. They are always appreciated. And Happy Holidays, Bah Humbug, and all that too. And Here's to all the best for our Setiathome community for the coming year. We hope to make a difference. Merry Christmas and a Happy New Year. Thanks for the update Matt. You and the rest of the crew have a Merry Christmas and Happy New Year! Thanks for the update and the kind words for the GPU Group. Thanks for the updates. Its always interesting to find out what is happening behind the scenes. The project is asking for one or more 240Gb (or larger) SSD's. Whatever happened with the Intel X25's? They must have died from too many IOPS by now. What are the new ones likely to be used for? Thanks, Matt. We always appreciate updates, the more detailed the better. And have a happy holiday of your choice. Waiting for a message from a small furry creature from Alpha Centauri. Message 1179810 - Posted: 21 Dec 2011, 20:10:31 UTC - in response to Message 1179684. I'll make a post over in the NC thread soon about the SSD's. the project went down for a bit, someone must be lurking. Message 1181158 - Posted: 28 Dec 2011, 18:41:26 UTC - in response to Message 1181155. WARNING!! "THIS IS A SIGNATURE", of the "IT MAY CHANGE AT ANY MOMENT" type. It may, or may not be considered insulting, all depending upon HOW SENSITIVE THE VIEWER IS, to certain inputs to/from the nervous system. 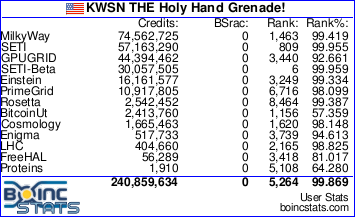 KWSN THE Holy Hand Grenade! Umm, unless there's a good reason not to, could someone bring beta back up? Message 1181422 - Posted: 29 Dec 2011, 18:02:21 UTC - in response to Message 1181372. Message 1181619 - Posted: 30 Dec 2011, 17:49:40 UTC - in response to Message 1181615. Message 1181620 - Posted: 30 Dec 2011, 18:00:12 UTC - in response to Message 1181619.
last I have are 6.97 apps - 14 of which I'm trying to report! Message 1182041 - Posted: 1 Jan 2012, 1:26:14 UTC - in response to Message 1179613.
me fall down...but me not want... HAPPY NEW YEAR !!! Time is now 02:54 here. I had a bottle of vine last evening, so I decided to stay away from it tonight. Apparently an accident with the public fireworks downtown. Fortunately no-one was injured. And apparently some Chinese lights in the sky as well. Never mind. Message 1182577 - Posted: 3 Jan 2012, 11:14:59 UTC - in response to Message 1179613. Hope you all had a happy holiday. Here's to the hope for MANY candidates this year. Also hope for solving of the wierd issues you have been having. Perhaps its voodoo, or Gremlins ???? Seriously, Happy New Year to all you folks.